March is #NationalNutritionMonth in the United States and Canada, a celebration that aims to reinforce the importance of developing sound eating and physical activity habits. Junior Leagues across the Association work to promote the importance of healthy eating, but we also know that for many in our communities, it’s not so simple. In 2016, 41.2 million people lived in food-insecure households in the United States, meaning they did not have consistent access to adequate food at times during the year. Join us throughout the month to learn more about the issues of food access and affordability, and the role they play in nutrition and health. Delve into this topic further on our editorial platform 19/01. Growing Up Gardens (GUG) implements edible food gardens in Monterey County schools in an effort to reduce childhood obesity rates by bringing awareness to healthy eating habits and the importance of knowing where food comes from. The Apple a Day Healthy Living Initiative™ is the Junior League of Philadelphia, Inc.’s multi-tiered community initiative with the goal of creating a positive impact on the health and wellness of adults and children in the Greater Philadelphia area. Apple a Day™ programming encompasses both interactive educational curriculum and a focus on increasing the region’s capacity to supply and distribute healthy food to families in need. The Junior League of Duluth’s “Let it Grow” program works to address food-insecurity in the Twin Ports as part of a coalition of community partners with shared vision and resources to establish a food secure community through empowerment, enrichment and education. 276 Leagues under the auspices of The Association of Junior Leagues International, Inc. The Association of Junior Leagues International undertook an international public awareness campaign entitled “Don’t Wait to Vaccinate” to alert parents to the importance of immunizations for their children. Designed to improve the health and well-being of at-risk children, The Junior League of Charlotte’s Healthy Child Initiative has served more than 22,000 children with programs to support their physical, dental and mental health. The Junior League of Orlando works with the Junior Leagues of Florida State Public Affairs Community in educating legislators about the need for retailers who sell healthy food in food-insecure neighborhoods. 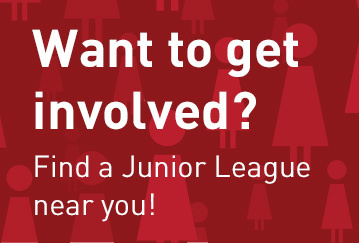 The Junior League of Philadelphia promotes children’s health and wellness, literacy, and environmental conscientiousness with a single after-school program for at-risk kids. Begun in 2001 by The Junior League of Calgary, Junior Chefs grew into a multi-national program now operating in more than 200 communities. With a significant portion of its city’s young people not being served with adequate medical care, The Junior League of Houston spearheaded the SuperKids Pediatric Mobile Clinic initiative to bring care to the children.